So to continue posting some of the pictures I took at gigs this year here’s the mighty King Size Slim at the Barge in Gillingham on 26th June. These were taken using my Samsung Galaxy S3 using the Camera App and Pudding Camera App. 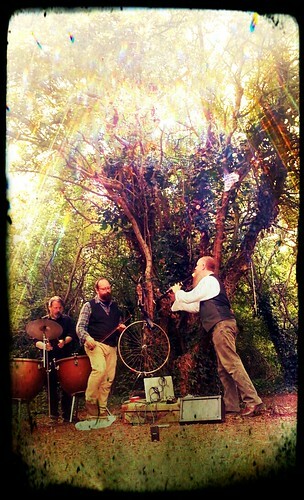 Sedayne Blandiver posted a version of Twa Corbies on Soundcloud today and as it was recorded today and it’s my birthday I asked if it could be my birthday present. 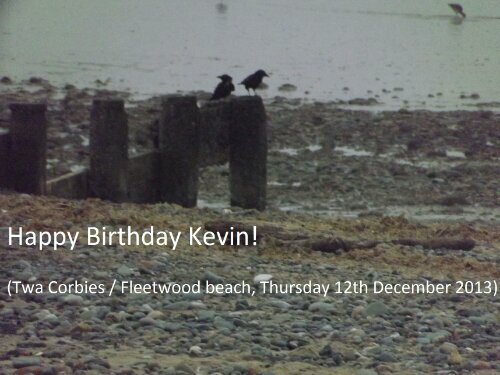 A few minutes later he posted the above picture of twa corbies on Fleetwood beach this afternoon. Check out the track it’s a belter! It struck me that the year is almost over and I haven’t actually posted many music pictures this year and I’ve seen some great performances in 2013. So in order to remedy that I’m starting with Hand of Stabs. I saw them 3 times this year – firstly at Rochester Library and then as part of their Month of Sundays tour at Grain Fort and finally at the launch of the film they made on that tour on board LV21 in Gillingham. We’re going to this next year! It’s £20 each for the weekend including camping and under 16s go free! There’s VWs, Scooters, live music, flushing toilets and showers! Sounds like a bargain too good to miss! We wanted to go last year but it clashed with my festival but SoL is earlier next year so we’re buying ourselves tickets as Christmas Prezzies! They’re available here! In the meantime here’s a couple of pictures from our holidays on the Isle of Wight last year!! Four years ago I set up a server in my shed with the aim of running my websites on it. On the whole it has been very successful apart from the time when I was suddenly thrown into the limelight by an article I’d written on my blog and a guy called Cory Doctorow republished it on his site Boing Boing and my server kept crashing due to the weight of traffic trying to access it! Sadly last week my server suddenly stopped working. I’d been getting spurious messages from it on my way up to London that looked as if someone was spamming my blog but they’d stopped mid morning. However when I tried to access my blog that night I found the server had crashed. I tried to reboot it by turning the power to the shed on and off a couple of time but without success. So I went out to the shed and found the screen saying “Press any key to reboot” – everything I tried came back to this same outcome so I came to the conclusion that something drastic had happened. 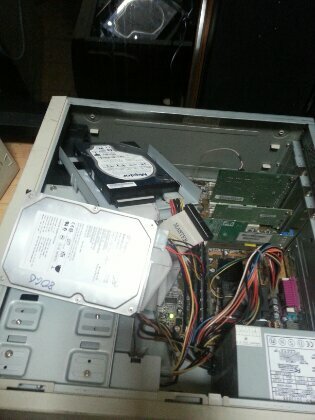 So the following I had a chance to look at it properly and it became apparent that the main hard drive was dead. So I had a rummage and found a few sitting on the shelf in the shed. The first 2 I tried were both 80Gb and I didn’t want to use such a big drive for the main drive. The third drive I found also seem to be dead but then I found a 20Gb one which I connected tot he computer and installed Ubuntu server on it before calling it a night! I thought I’d got my server to a point where I could do the rest remotely from inside the house but I’d forgotten that I hadn’t installed ssh server which would let me use putty to control the server. I had changed the IP address to a static one – I don’t know why this isn’t a set up option as it would make sense to me to have a fixed IP rather than one allocated by DCHP. This change seemed to have also caused problems with DNS lookup and I had to solve that issue so I could load ssh-server and then Webmin. Once this was done I went back inside and continued the set up by installing Apache webserver and Mysql database and setting up access to drives. I decided that it’d be an idea to replace the second drive as well – it was only 6Gb and almost as soon as I’d set up the server originally I realised that it probably was a mistake – that was about 4 years ago! So I connected one of the 80Gb drive I’d found the day before. At this point I was almost ready to start putting the data back again. I had a regular back up for the MySQL files but I was disappointed to find that I hadn’t backed up the rest of the website files since June 2010!! It would mean that some of the recent changes would not have been included and although I knew I would have them somewhere else it would just mean more work. So I copied the website files onto the new 80Gb files and set up the virtual servers for each of the 3 domains. This worked remarkably well – due in no small part to a site I’d found with step by step instructions. I got as far as I could and eventually called it a night at about 1:30am! So my first task the following morning was to transfer the data from the old 6Gb drive to the 60Gb partition on the “new” drive. I knew the washing machine, dishwasher and tumble dryer were all on so in order to avoid someone putting the kettle on and tripping the power I moved the kettle over to the cooker socket which is on a different fuse. There was about 15 minutes to go when Sarah put the hoover on and bang the power went off. Luckily I was controlling the transfer from my laptop upstairs and that stayed on. I rebooted the server and waited for it to come back up before doing anything. To my surprise the only thing that happened was the file that was transferring at the time was skipped and the transfer continued. Once it had all transferred over I disconnected the old drive and put the computer back together again. The main thing I had problems with was setting up an FTP site and updating the WordPress installations – none of which were going well. Try as hard as I could I could get the ftp client to log in but it wouldn’t see anything at all. Similarly the WordPress update just wouldn’t happen. We went shopping and when we got back I had another go but after an hour and a half all I’d managed to achieve was to give myself a headache and I also felt sick. So I decided to have a lie down for half an hour and woke up 3 hours later having missed dinner! Later that evening I decided to try again and quite sensibly I started by deleting the virtual ftp server I’d set up and started again. This time it worked first time! I later employed the same concept to the blogs by deleting the blog directory and installing the software fresh. I then found that I could start the installation by going to the admin page and entering the database name. Once it had connected I simply copied the content from the back up file and it all fell into place! At this point it was time for bed but the server set up was complete enough that I could now start adding the bits that were lost because I hadn’t backed it up for three and a half years! This would mean trawling through several locations to try and find them! And that’s exactly what I did! I found about 99% of the images from the 3 blogs and have managed to re-create the rest! I also tracked down most of the missing Web pages. So it’s taken me just over a week to get back to where I started! Now………… I must remember to do a back up! Folk Police Showcase at Leigh Folk Festival, a set on Flickr.